MUNJOR, Kan. (CNS) — Growing up in Munjor, and later Hays, fraternal twins Amber and Brianna Wooldridge were used to celebrating milestones together. From their baptism and their birthday to first Communion, confirmation and graduation, pictures and home videos tell the story of sisters used to sharing the major events in each other’s lives. Fast forward to 2016 when Amber and Brianna, both newly engaged, began planning their weddings, Amber to Zach Binder and Brianna to Clay Kear. The sisters were part of each other’s plans from the beginning, both preparing to be the other’s witness during her nuptial Mass. As the arrangements began to take shape, the pair and their husbands-to-be discovered that scheduling was going to be difficult. Initially both weddings were scheduled within weeks of each other. “He was joking, but it made sense,” Clay told The Register, newspaper of the Diocese of Salina. While the couples wanted their own separate days, Brianna said the logistics of having a double wedding started to become clear especially when considering that some attendants would otherwise be in both weddings and the twins’ extended family members and friends who live out of town might have to choose to attend one wedding over the other. Clay and Zach were on board with the idea as well. While the couples did their formal marriage preparations through the Catholic Church separately, the four came together in front of family and friends this summer at St. Francis of Assisi Church in Munjor to celebrate their nuptial Mass. 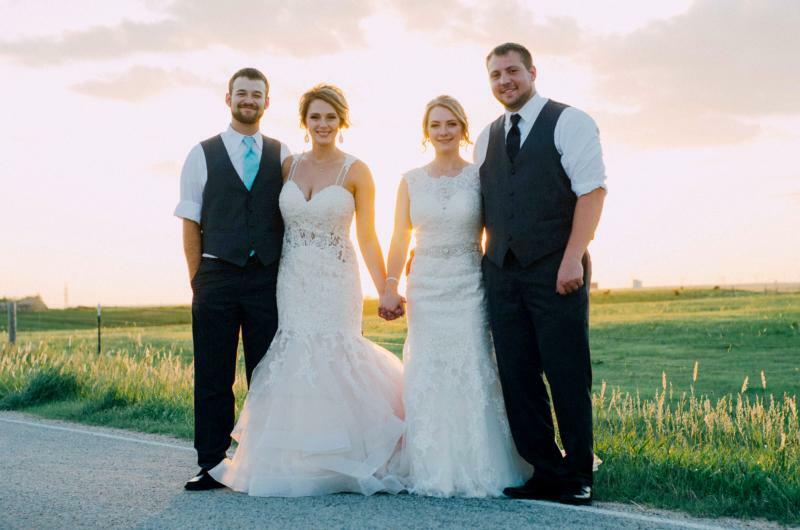 As planned, the sisters served as witnesses for each other, with their brother, Tyler Wooldridge, serving as best man and witness for Zach and Amber’s vows, and friend Philip Nowak serving in the same capacity for Clay and Brianna. For celebrant Father Jarett Konrade, the July 7 double wedding was a first. Now, having been married for almost two months and living on opposite sides of Kansas, Clay and Brianna in Edgarton and Zach and Amber in Hays, the couples agree that sharing their wedding ceremony was truly something unique. Brianna recalled watching a home video of the twins’ baptism during a visit with some family members a week after the wedding. The sacramental aspect is something Father Konrade noted in speaking about the rarity of this double wedding. As the couples look toward the future, they know the sacraments and their faith will be the foundation of their unions, and that their faith, like their wedding day, is meant to be shared.